Teak wood is become our choice as main material for our wooden handicraft and furniture products, because Teak wood has known as the strongest wood in the world and durable in any seasons. The reputation of Teak throughout the whole world in producing furniture of the highest quality has, however, never faltered. The strength and beauty of its fiber is the primary reason that Teak wood continues to be a main choice for furniture material. As chess pieces manufacturer, we have variety chess type in sizes. 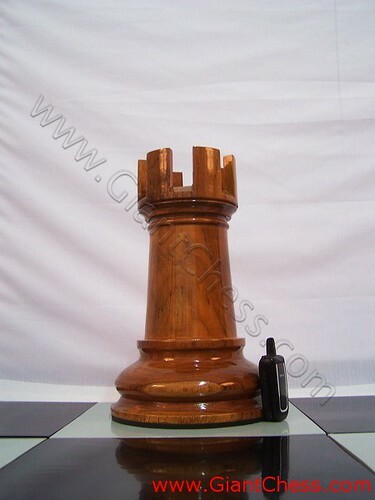 Here is we show you a Rook chess piece in big size. It has carved by our expert craftsman and polished in brown or natural wood color. Usually use for chess game as chess soldier, but some people use it for house decoration. Get also Rook chess in black and others color with various sizes!